An orange is a fruit liked by most people..And because its a seasonal fruit, I enjoy buying every variety available in the vegetable shop to relish every taste. The juicy, tangy flavour really fills me with energy. Actually, I don't mind drying out and storing the orange peels for its beauty benefits too ;) Among all the varieties of oranges, Mandarin Oranges are relatively smaller ones with pleasant taste. In our home remedies, if we eat or apply it on the top of skin, many skin benefits can be achieved so easily. For the lazy bones like me, Anherb has simplified the job for preparing the home remedies and has come up with a body lotion made of mandarin oranges. 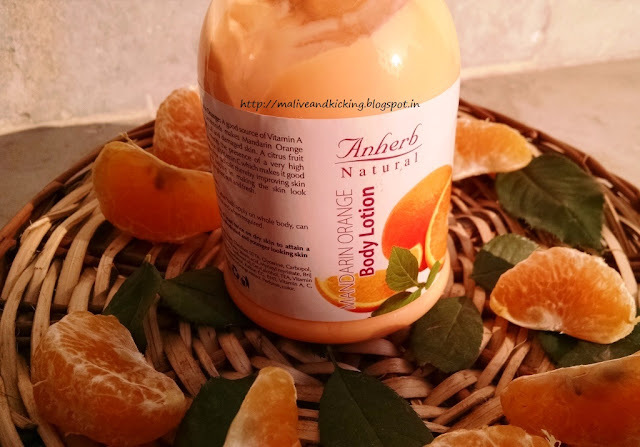 Recently, I got Anherb Mandarin Orange Body Lotion as a part of my winter care kit from the brand and I could not resist applying it almost immediately. So sharing my first impression with the product. 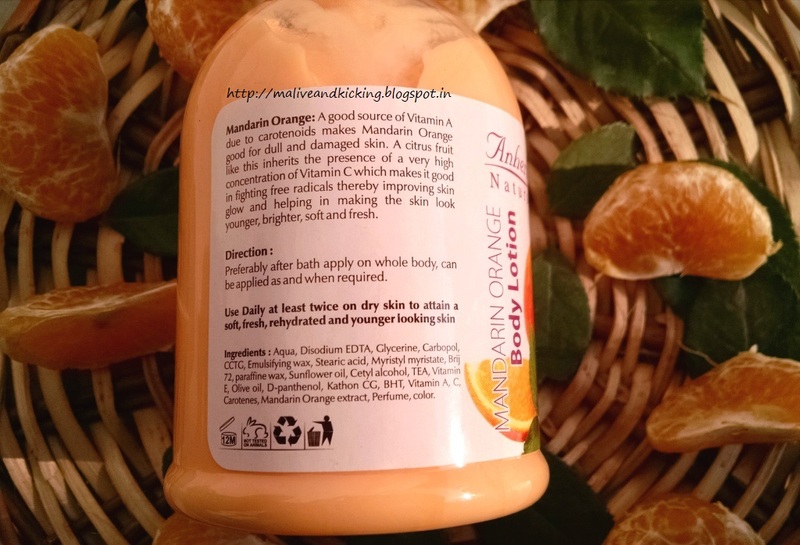 Product Details: A good source of Vitamin A due to carotenoids makes Mandarin Orange good for dull and damaged skin. A citrus fruit like this inherits the presence of a very high concentration of Vitamin C which makes it good in fighting free radicals thereby improving skin glow and helping in making the skin look younger, brighter, soft and fresh. What I feel about the product performance? 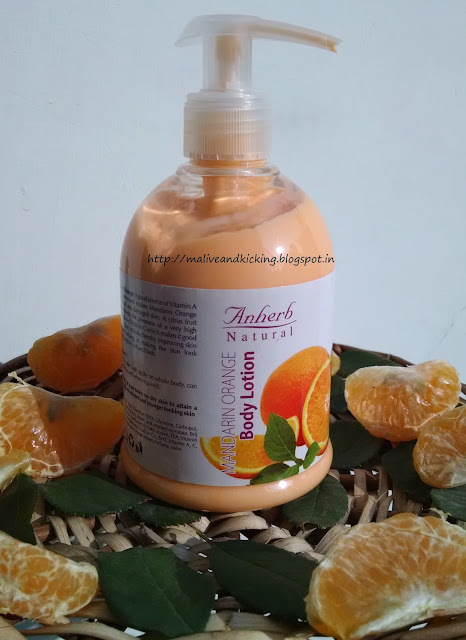 I seriously had been eyeing on Anherb Mandarin Orange Body Lotion since long. There had been a gut feeling that this product will fare very well for my skin. Well! its is a pleasure to review it at the right time when the cold, dry winds are making my skin flaky. The mandarin body lotion is a delightful looking lotion in light orange color. Its like a breath of fresh air when you smell its delicious sweet fragrance. My junior finds its yummy smell identical to his favourite orange flavoured waffles. ;) The fragrance is quite short-lived, so no worries if don't wanna smell fruity. The lotion is thicker than most products of this line and I'm definitely loving its super rich, creamy texture a lot.. I've started applying it on body after bathing for better soaking up by the skin. Upon application on damp skin, there is no greasy feel rather deep hydration makes my skin plump, smooth and much more even looking. Its prolonged use may work towards reducing minor skin damages due to presence of carotenoids that protects skin tissues against environmental toxins. I have a habit of rubbing some hand cream frequently as my hands get rough n dry every time they come in contact with water. This thick body lotion can double up as a hand cream too due to its whipped consistency that softens the skin of my hands hiding visible jerks. A pea-sized quantity applied on face contributes to flawless, younger look that we all want and causes no break outs. It may not be that appropriate for oily skinned people specially on face. This packaging of body lotion is a family-sized, economical pack that comes in clear tumbler with pump dispenser opening. So its more suited to be placed on your washroom rack or may be on the bedside table like in my case. To make it travel-suited, simply transfer some quantity in a small portable bottle to carry around. Renders natural glow to skin. Can be used on body as well as face. Doesn't cause skin break out. 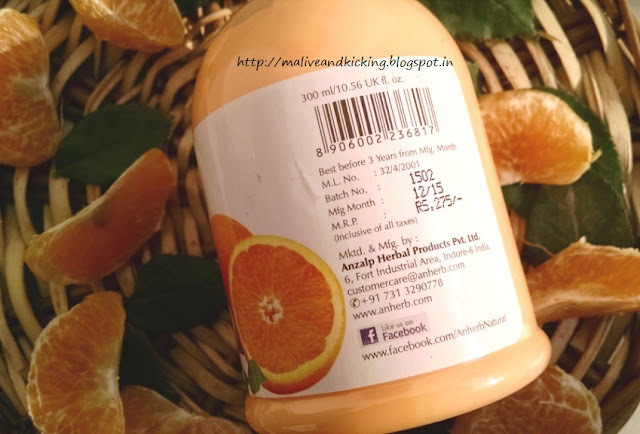 Oranges has the property to clear your skin amazingly. And still I make orange peel scrub at home as my scrubber. Your review for this product says its a nice and will give good results. I agree with u Bhawna. 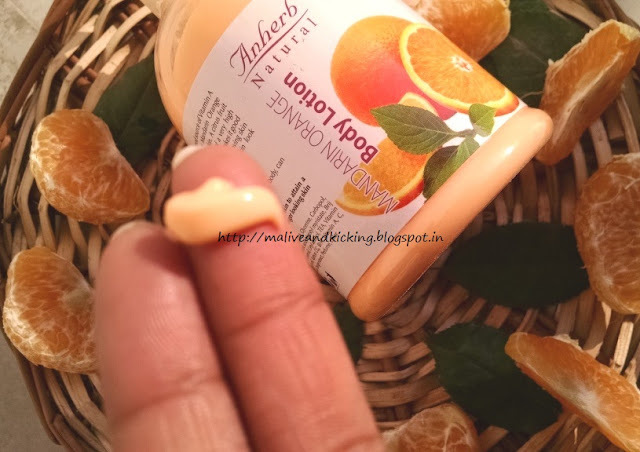 Orange peel is one of the best remedy to get clear skin. What is the hydrating bas they have not mentioned. No butter, no oils I really doubt the ingredient list. Great review though! take a closer look at the ingredient list dear..there are oils like olive oil, sunflower oil n glycerine as well. I like using citrus fragrances. They are quite refreshing. And if this adds a nice glow, it seems good enough to try out.